While I am not an advocate of the mentality that would lynch all women who have been 'so-called brainwashed' into thinking that wearing a relaxer is the only way to be true to yourself in this day and age (in order to fit in in corporate environments for e.g.) I do advocate natural hair... I also hate the word 'relaxed hair' because it implies that my natural hair is uptight and needs to chill out lol! If a woman with straightened hair says she wears it that way because 'natural hair looks untidy or unprofessional or locks look dirty' or because 'my hair too hard, too coarse, too picky, too difficult' I'd be annoyed, cos a little TLC could address most of those things and because the perception of not being able to fit in with natural or locked hair or not being respected etc is much deeper seated than the words coming from her mouth. I'd want her to know that she was beautiful with or without straightened hair - her hair should not define her, as India Arie stated - I am not my hair. Of course, we do not live in utopia. Perceptions and misconceptions rule our every action. You start to question - did I get passed over for promotion because my accent was too ghetto? Did I not make the shortlist after the interview because my hair was twisted/afro/locked? The opportunities for self-doubt are almost endless. I don't think these questions are that different to what my European sisters may ask themselves when faced with similar situations: "Are they not taking me seriously because I am too blonde? ", "Did my dark hair make me look too goth? ", "Did I miss out on that because I sounded too chav?" Growing up, I thought my hair was 'hard' and difficult to manage but I loved it anyway. It was only after I did my third 'Big Chop' in 2007 that I found my natural hair texture to be soft with a looser curl. I understand now why it is that when I advocate 'natural hair', some of my friends say :"Well, it's easy for you to say, you have good hair." but honestly, when my hair was dry, crispy and tangled, it didn't feel good... and I didn't think it was 'good hair'. If I hadn't taken the time to interview my hair and find out who it was and what it liked, I'd probably still be straightening it (and my husband would be very happy). If a woman says to me - I relaxed my hair cos I like it/cos it best suits my lifestyle etc in such a way that she is genuinely expressing an informed preference, has no underlying issues with her hair texture, doesn't think that natural haired women are 'nappy headed jokers' or 'unprofessional looking' and has actually spent time with her natural hair understanding how it feels, how it coils and how it grows - I HAVE NO ISSUE WITH HER - rock on wid ya bad self my sista because nowhere is it written that we should all look the same. You rock yours straight, I rock mine locked, she rocks hers curly and we all do our thing - in love. I love this post! It's a topic close to my heart. I had my first taste of chemical hair processing at aged 9! This was my mothers choice as my hair was extremely coarse, and thick and not the easiest to manage. I was the only one in my family with hair like this and I was constantly reminded that I had "hard" hair and it was too hard to comb. 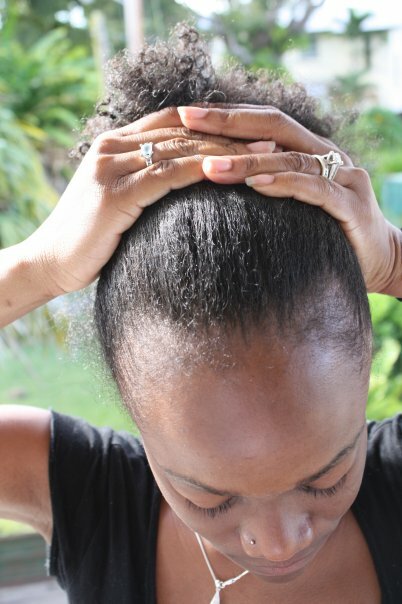 This made me insecure for years, and fast forward 10 yrs and I finally decided to go natural. Through a solid circle of friends and my own spiritual awakening I realised that even though I am not my hair, it represents how comfortable I am as nature intended. I wore it natural for a few yrs before growing locks in 2000. I often had peopke tell me that I have good hair too. This used to surprise me since me mixed grandmother would always let me know how "hard" mt hair is while brushing my hair back to give me slanted eyes. When I went natural at 14 I used to hear how musty my hair was looking, but like you after I learned my hair I and the world realised just how cool it is. @ Kristina - course you're excused :) Amazing how lots of people can have supposedly 'good' hair and not know it/not see it that way! Here's a toast to knowing your own hair. @ Real Nique - right back at ya! Why Are Women So Quick to 'Cry Down' Other Women? I Had A Sisterlocks Moment! My Hair at 5 Months.